Will Clark was one of my favorites growing up. How could he not be? His nickname was "The Thrill" and boy did he. In his first AB in the Majors, Will Clark hit a home run off Nolan Ryan. 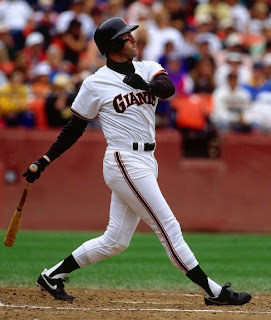 He was one of the cornerstones of some good Giants teams in the late 80's and early 90's. As a Giant Will was a 5 time All Star, and hit .299. He hit 19 or more HR's 5 different times. Twice the Giants made the playoffs with Clark as the first basemen. In 1989 he was named MVP of the NLCS victory over the Cubs. Clark's final season as a Giant was a memorable one. The Giants won 103 games but fell short of the playoffs. Over the 8 seasons that Will played at the Stick he had 709 RBI and 176 HR's. His fight with the Cardinals in the 80's made him a fan favorite for life. Will "The Thrill" Clark was one of those guys we grew up pretending to be in the backyard. As you can see the Giants are deep in their history of first basemen. Bill Terry was one of the greats of the game that probably doesn't get enough publicity. He is 5th all time in the franchise in total games played. Terry was the MVP of the 1930 season. That year he hit .401. The starting first baseman for the NL in the first 3 All Star games was Bill Terry. Over 9 straight years Terry had a batting average above .320. He retired with a career .341 average, which is a modern NL record for left handed hitters. As player/manager in 1933 Terry led the Giants to a World Series win over the Washington Senators. IN all he managed 10 seasons for the Giants winning 3 pennants and the one ring. 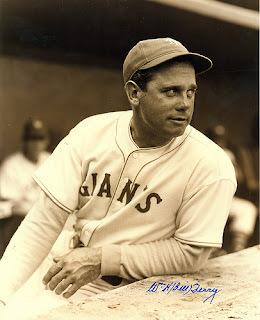 In 1954 Bill Terry was inducted in to the Baseball Hall of Fame. I'm not going to lie to you. It took me a while to go with McCovey here. The more I researched Terry I liked him. But there's something about "Stretch" and what he means to the franchise. He is the greatest first baseman the Giants have ever had. Willie won the Rookie of the Year award in 1959, and didn't stop hitting. He was a 6 time All Star as a Giant. The Cove is named after the guy for goodness sake. Willie is 3rd all time in Giants history in games played, but he only made the postseason twice. Never winning a World Series. 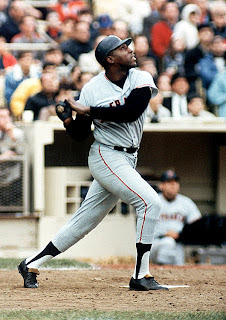 His 469 HR's as a Giant place him 4th on the all time franchise list behind Ott, Bonds, and Mays. Fielders were known to say that the sound of ball off the bat of "Stretch" just had a different sound. He hit line drives that could give a haircut. The 1969 NL MVP is one of the most beloved players in franchise history. The "Willie Mac" award was created to honor him, and the Giant that best represented the organization. It is now a very prestigious award in the clubhouse. Willie McCovey was elected the the Hall of Fame in 1986.